Dog Eye Problems | Protect Your Pet Against Common Eye Problems in Dogs Like Cataracts, Conjunctivitis And Glaucoma! When it comes to dog eye problems, much can be done to resolve potentially damaging conditions if they are treated quickly. Pet owners who inspect their dog's eyes on a daily basis are in the best position to spot sudden changes and take action to protect their dog's most precious sense - their vision. And this daily practice is not just for mature dogs - puppy eye problems occur also. Some of the more common disorders that affect a dog's eyes are conjunctivitis, dry eye, excessive tearing, corneal ulcers, cataracts, glaucoma, and lid problems. Eye injuries are also quite common and can look scary. Because of the risk of serious damage, expert attention is the way to go when it comes to an eye injury. And another scary-looking condition is cherry eye in dogs. This disorder occurs more often in dogs with prominent eyes and dogs younger than two years, but it can affect any dog breed at any age. While it definitely needs to be evaluated, it is not usually an emergency. Dogs' eyes that are healthy look bright, clear, moist and free of discharges. Whereas, eyes with potential problems may look red and/or bloodshot, with signs of swelling or pus on the eyeball. The pet may also be blinking or squinting frequently and the eyes may be tearing more than usual. While we can learn to recognize the symptoms of dog eye problems, many conditions need a test to verify what is going on. But in general, if your dog has red eyes this normally is a sign of inflammation and if it is present in the upper white part of the eye, it is serious enough for your vet's attention. It could mean he has a case of conjunctivitis. Cloudiness could indicate serious problems such as glaucoma or cataracts. Diabetes is the main cause of cataracts which can progress to glaucoma, so a vet definitely should be consulted promptly. Winking or squinting can be a sign of a corneal ulcer, a condition that needs immediate attention. In fact whenever you become aware that your dog may have an eye problem, the wisest move is to take your dog to see the vet. Left untreated some conditions can result in permanent damage. Eye problems such as conjunctivitis and excessive tearing can lead to infections. Plus conjunctivitis in dogs can be confused with dry eye. In either case, a vet can test a dog's tears to determine which condition is actually present. This is really important when it comes to getting the right treatment. While the former may need antibiotics, the latter may only require some supplemental eye drops. Excessive tearing can also be indicative of an eye injury or allergies, or may be nothing at all. Daily eye inspections will alert an owner of tearing changes in their dog. 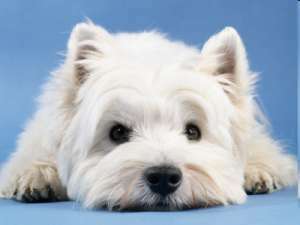 Hereditary eye problems to be aware of that affect many breeds are cataracts, glaucoma, and progressive retinal atrophy. Bloodshot eyes could mean that pressure is increasing in the eyes. This is one of the signs associated with glaucoma, a very serious, potentially blinding condition which needs immediate treatment. Inspect your dog's eyes daily. Look for any changes such as excess tearing, redness, scratches on the eyeball, debris or discharges, any signs of cloudiness, or hair around the eyes that is becoming matted. Also check for eyelashes that may be impeding vision. Have a bowl of warm water and some cotton balls ready to gently clean any areas where discharges may have accumulated. If necessary, carefully trim away any hair that may scratch or irritate the eyes or has become matted - to keep bacteria at bay. Dogs that naturally produce more tears, may have noticeable staining present that can be cleaned with botanical products such as TrueBlue Safe and Sure Eye Wipes . For debris such as dust or other non-embedded material, use a natural eye wash to flush out the obstruction. But when there is something deeply embedded, professional skills will be needed to remove it. When your dog has the dog eye problem of dry eye, you can try to alleviate it with eye drops such as Opticlear. If no improvement is seen, your dog needs to see the vet for further analysis. Along with good grooming, a natural organic diet free of any chemicals or anything artificial will provide the nutrient protection against dog eye problems. Added protection against free radical damage can be supplied with vitamins A,C and E along with bilberry extract. Closely observing your pet on a daily basis is the best way of discovering dog eye problems that in turn gives you an opportunity to quickly take action to heal the condition.